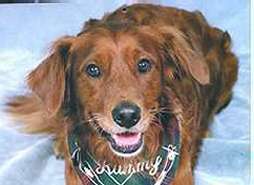 Rummy was found roaming the streets of Schenectady in December of 1997, starving and the obvious victim of abuse. He was placed in foster care with guiding eye dogs for 5 months while he was rehabilitated. Iris Bartkowski adopted him from GRROWLS in May of 1998. He lives with a mixed-breed rescued dog and a rescued cat and is now a Therapy Dog who visits hospitals, nursing homes and a center for the disabled in the Capital District area.